It will provide a solution in collaboration with Subex for analysing IoT traffic on networks and detecting threats. LONDON, UK, 11 APRIL 2019 – Subex, a leading security solution and telecom analytics provider announced its partnership with Telefónica on a new cybersecurity venture focussing on IoT Security. This collaboration will be realised through a new cybersecurity unit recently launched by Telefónica. As the number of devices connected to the internet grows exponentially, the risks associated with them also grows in parallel. To address these threats and to promote IoT implementation, Telefónica has launched this initiative with a twofold objective. On the one hand, this unit will strive to expand the existing catalogue of IoT products and services offered to customers and, on the other hand, to develop new IoT security solutions to cater to the existing and emerging threats faced by businesses deploying IoT. This unit will leverage Telefónica’s existing network infrastructure and the Kite Platform, an IoT connectivity management platform that allows businesses to improve efficiencies while reducing costs. As part of the new solutions developed by this new initiative, Telefónica, via its ElevenPaths cybersecurity unit, has expanded its collaboration with Subex, with whom it already offers a Fraud Management as-a-service solution (FMaaS). The new scope of collaboration extends to analysis of the data traffic generated by IoT devices, and detection of specific threats in this field. Considering many IoT devices have limited capabilities in terms of having in-built software to protect them, the offer of cybersecurity solutions embedded within the network and traffic is a differential factor. Subex’s IoT-specific platform is capable of analysing traffic by applying machine-learning algorithms, generating an alert every time it detects a threat that jeopardizes cybersecurity of the IoT device. “Cybersecurity has become one of the companies’ priorities. We are seeing the emergence of a culture around security that is sensitive to processes, strategies and methods designed to minimize risks while increasing value. This collaboration with Subex represents a step forward in our strategy of helping companies protect their investments, assets, and credibility”, said Pedro Pablo Pérez, CEO of ElevenPaths and VP of Global Security at Telefónica. “This agreement will add a new dimension to our existing relationship by enabling us to work together towards securing the IoT ecosystem”, indicated Vinod Kumar, Managing Director and CEO, Subex. “Amidst all kinds of attacks by cybercriminals and other groups, we want to protect the ecosystem and ensure that IoT projects deliver value. I am confident that IoT businesses will derive significant benefits from our joint efforts”. At ElevenPaths, Telefónica Cyber Security Unit, we believe in the idea of challenging the current state of security, an attribute that must always be present in technology. We’re always redefining the relationship between security and people, with the aim of creating innovative security products which can transform the concept of security, thus keeping us one step ahead of attackers, who are increasingly present in our digital life. Telefónica IoT is the Internet of Things global department at Telefónica, dedicated to developing and implementing IoT solutions in all industry segments. It offers its clients global end-to-end solutions around the world with the very best connectivity and is available in all countries via its presence there or via roaming agreements and partnerships. Some of the main business areas covered by Telefónica IoT include Smart Mobility, Smart Retail and Smart Energy. For more information about Telefónica IoT, visit iot.telefonica.com or follow us on twitter @telefonicaIoT or on LinkedIn. Subex is a leading software solutions provider, working towards enabling a secure digital future for businesses. Founded in 1992, Subex has spent over 25 years in enabling 3/4th of the largest 50 CSPs globally achieve competitive advantage. Through its Internet of Things security offerings including an IoT Security solution, VAPT, managed services and consulting services, Subex helps businesses operate with the highest levels of assurance while securing their infrastructure from cyberattacks, malware and other threats. Subex today operates one of the largest Honeypot networks in the world across over 60 cities around the world. Subex has more than 300 installations across 90+ countries. Visit safeandsecureiot.com or connect with us on twitter or Linkedin for more information. 29TH JANUARY 2019, BENGALURU, INDIA – Subex, a leading telecom analytics solution provider, today announced its consolidated financial results for the year ended December 31, 2018. Revenue for the 9 months ending 31st Dec 2018 at INR 24,625 lacs as against INR 24,367 for 9 months ending 31st Dec 2017. Launched next-gen fraud prevention solution to help telcos proactively deal with existing and emerging fraud types like digital fraud. Vinod Kumar, Managing Director & CEO, Subex said, “In line with our Subex 3.0 strategy, the third quarter of FY19 marked our entry into newer verticals through the launch of CrunchMetrics. Additionally, we continue to expand our capabilities on IoT Security and have now expanded it to cover the needs of Oil and Gas and logistics verticals. These have helped us to forge new partnerships that will play a crucial role in our future growth. We will continue to invest in these new high growth areas. Subex is a leading telecom analytics solutions provider, enabling a digital future for global telcos. Founded in 1992, Subex has spent over 25 years in enabling 3/4th of the largest 50 CSPs globally achieve competitive advantage. By leveraging data which is gathered across networks, customers, and systems coupled with its domain knowledge and the capabilities of its core solutions, Subex helps CSPs to drive new business models, enhance customer experience and optimise enterprises. Subex leverages its award-winning product portfolio in areas such as Revenue Assurance, Fraud Management, Asset Assurance and Partner Management, and complements them through its digital solutions such as IoT Security and Insights. Subex also offers scalable Managed Services and Business Consulting services. BENGALURU, INDIA – Subex, a leading telecom analytics solution provider, today announced its financial results for the year ended September 30, 2018. Town of Florence, Arizona, USA has chosen Subex to cybersecure their critical public infrastructure. When Florence launches its smart cities project, Subex will continue to be the cybersecurity partner for all projects coming under the plan. Increased visibility around IoT Security in key markets through partnerships and participation in summits such as Singapore Cyber Security Week and Mobile World Congress Americas. Vinod Kumar, Managing Director & CEO, Subex Limited said, “Every organization today has started on their digital transformation journey in some form or the other. To drive real business value from this transformation, these organizations require the support of strong technology partners to provide innovative solutions. Riding this wave of demand, we are pleased to have ended this quarter on a strong note, having achieved our targets. We closed a number of new marquee customer wins and witnessed good traction from the APAC, MENA, and Africa markets. Subex will host an investor conference call at 4:30 p.m. IST on August 1, 2018 to discuss the results for the first quarter. Vinod Kumar, Managing Director and CEO will preside over the call. Founded in 1992, Subex has spent over 25 years in enabling 3/4th of the largest 50 CSPs globally achieve competitive advantage. Subex helps CSPs to drive new business models, enhance customer experience and optimise enterprises. The Board of Subex Ltd, a leading global provider of Business Support Systems (B/OSS) for Communications Service Providers, has today appointed Mr. Vinod Kumar as Managing Director and CEO of the Company effective 1st April 2018, on expiry of the term of Mr. Surjeet Singh. Vinod has been Subex’s Chief Operating Officer since 2013 and is also a member of the board. Mr. Anil Singhvi, Chairman said “We are excited to appoint Vinod as the next CEO of Subex. We’ve selected a strong leader from within at a time when Subex is in a very stable position. Having spent more than 20 years at Subex, Vinod knows well its’ ecosystem and is a champion of the culture and ethos of Subex and has an ability to inspire, energize, and connect with customers, employees and other stake holders. This, combined with his ability to strategize and execute, is what Subex needs as we enter the next chapter of growth and will move the company forward with the speed required to capitalize on the opportunities in front of us”. Vinod Kumar joined Subex in 1997 and was part of the team that created software business at Subex and was instrumental in creating the sales and marketing channels that has become a great strength of Subex. He moved quickly through the company’s rank and most recently served as Chief Operating Officer of Subex and is also a member of its board. In his role as COO he led the worldwide operations covering portfolio development, business acquisition and fulfilment. He has helped lead and execute many of the company’s new initiatives including managed services which accounts for over 25% of the current revenues at Subex. On this occasion Vinod Kumar said “I am honoured to lead Subex, as we take our next step towards making Subex a growing, profitable and sustainable company. Over the last 25 years, we have emerged as a global leader in the revenue and capex management space within the Telco segment, saving millions of dollars for our customers. The increasing adoption of digitization and IoT expands the market that we operate and make it extremely exciting. The opportunity that lies ahead for Subex is enormous and the ability to lead it to the next phase is deeply humbling and exhilarating. Our global customer base and a set of extremely committed Subexians gives me the confidence that we have a great future ahead”. Subex Ltd. is a leading telecom analytics solutions provider, enabling a digital future for global telcos. Founded in 1992, Subex has spent over 25 years in enabling 3/4th of the largest 50 CSPs to globally achieve competitive advantage. By leveraging data gathered across networks, customers, and systems coupled with its domain knowledge and the capabilities of its core solutions, Subex helps CSPs to drive new business models, enhance customer experience and optimise enterprises. BENGALURU, INDIA – Subex Ltd, a leading telecom analytics solution provider, today announced its financial results for the quarter ended December 31, 2017. Subex secured a multi-million-dollar deal with a tier 1 Group having telecom operations in Middle East and Africa to implement its Business & Application Managed Services. Successfully renewed existing Group Framework Agreement (GFA) with a leading African telecommunications company for its ROC Revenue Assurance and ROC Fraud Management Solutions for 5 years. A leading Latin American telecommunications company has contracted Subex to implement Subex’s Integrated ROC Revenue Assurance & ROC Fraud Management platform, across their fixed line, mobile and enterprise businesses. Subex Ltd. is a leading telecom analytics solutions provider, enabling a digital future for global telcos. BENGALURU, INDIA – Subex Ltd, a leading telecom analytics solution provider, today announced its financial results for the quarter ended September 30, 2017. Won a multi-million dollar deal with a leading APAC telecom operator to implement its ROC Asset Assurance Solution for Capex Optimization and managing the lifecycle of its network assets. Pioneered Real Time Revenue Assurance by deploying the largest implementation for Real-time Revenue Assurance for a top-tier Indian telecom service provider through its ROC Revenue Assurance solution. Won a multi-million dollargroup deal with a leading European TV and broadbandprovider which has got operation across multiple European countries to deploy its ROC Partner Settlement managed services. 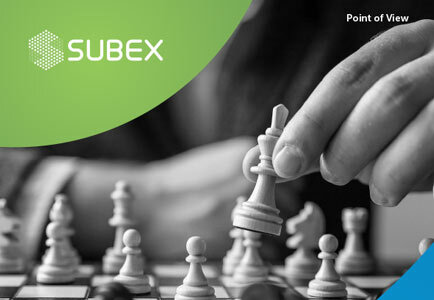 Launched Subex Consulting and Advisory Services, blending strategy and execution to deliver business assurance for global telecom operators, specifically around the domains such as risk, margin, maturity and transformation. Successfully hosted the 14th edition of the Subex User Conference in Zagreb, Croatia on 24th– 25th October 2017. The theme of the conference was “Digitalisation: Mirroring Opportunities with Reality”, and focused around implementation and operational aspects of digital transformation. The conference witnessed the participation from 100+ delegates from leading telcos across the globe. We continue to make necessary investments in our portfolio, people and processes to augment our competitive edge to partner with our customers in digital future. Our recently concluded customer conference reinforced our Strategic agenda of standing for driving new businesses for our customers and enhance and optimize current enterprise. I am confident that our initiatives will yield results in midterm even as short term deflationary challenges and increased cycle times are headwinds in short term. BANGALORE, INDIA – Subex Ltd, a leading telecom analytics solutions provider, today announced the launch of its Consulting and Advisory Services. The announcement was made during the 14th edition ofthe SubexUser Conference which is the company’s flagship global conference. Subex’s Consulting and Advisory services blends strategy with execution to deliver tangible outcomes around business assurance. Through the Consulting and Advisory Services, Subex leverages its 25 years of experience and expertise in the telecom domain, with over 200-plus customers. Subex deploys flexible engagement models that are best suited to CSPbusiness dynamics. Subex’s Consulting and Advisory services will cover all aspects of the telecom business assurance requirements, specifically around the domains of Risk, Margin, Maturity and Transformation. LONDON, UK – Subex Limited, a leading telecom analytics solution provider, has been selected by ElevenPaths, Telefonica Cybersecurity Unit to offer a Fraud Management-as a- Service (FMaaS) solution. Telefonica is one of the world’s largest telecommunications companies, with a global presence in 21 countries and an average of 125.000 professionals and 350 million accesses. The agreement between Telefonica and Subex will result in the new ’Telefonica FMaaS Powered by Subex’ to protect against a comprehensive set of digital risks and threats, along with a library of fraud detection processes. The solution addresses Subscription Fraud, Internal Fraud, Premium Rate Service Fraud (PRS Fraud), and International Revenue Share Fraud (IRSF), amongst others. Additionally, ROC Fraud Management technology deployed by Subex will deliver the ability to deploy client-specific detection processes, techniques and strategies, based on particular business needs at each site. “We are excited to partner with Telefonica for enabling Subex’s industry leading ROC Fraud Management Solution. In the process of undergoing digital transformation, organizations today foresee emerging threats and newer frauds, due to which customers are demanding real-time and proactive fraud management solutions. This partnership is an important step to make our customers more successful in the years to come whilst they transform themselves for the Digital Journey ahead” said Surjeet Singh, CEO & MD, Subex Limited. “We are delighted with our partnership with Subex, a global leader in managing fraud in the digital world. Compared to traditional solutions, the enablement of FMaaS will ensure much faster deployment times, providing far more flexibility, easier access and agility, to our business operations. Subex’ capabilities together with ElevenPaths’ expertise in the development, deployment and operation of antifraud products and services across the world, will enable us to deliver customised Fraud Risk & Business Resilience though a best-of-breed Adaptive & Convergent Fraud Risk Management Solution. This, in turn, will help our customers deal with fraud risks more quickly and effectively”, said Pedro Pablo Perez García, CEO of ElevenPaths. At ElevenPaths, Telefónica Cybersecurity Unit, we believe in the idea of challenging the status-quo in Security, an attribute that must always be present in technology. We are always redefining the relationship between security and individuals. We aim at creating innovative products, which can transform their experience, helping them to keep one-step ahead of attackers, an increasing threat to our digital life. Subex Ltd. is a leading telecom analytics solutions provider, enabling a digital future for global telcos. Founded in 1992, Subex has spent over 25 years in enabling 3/4th of the largest 50 CSPs to globally achieve competitive advantage. By leveraging data which is gathered across networks, customers, and systems coupled with its domain knowledge and the capabilities of its core solutions, Subex helps CSPs to drive new business models, enhance customer experience and optimise enterprises. Bangalore, INDIA – Subex Ltd, a leading global provider of Business and Operations Support Systems (B/OSS) for Communications Service Providers (CSPs) announced that it will be hosting the 13th edition of its Global User Conference from 25th to 27th of October, 2016 at Jaipur, India. The 2016 User Conference will be attended by delegates from leading wireless and wireline operators across the globe. Among the keynote speakers for this year’s User Conference is Shara Evans, Technology Futurist and CEO – Market Clarity, who is widely regarded as one of the world’s top female futurists, fusing her engineering background with an intuitive understanding of how society is likely to respond to new technologies. Also joining her are Anthony Sani, Executive, Group Revenue Assurance and Fraud Management at MTN Group, Kanishka Wickrama, Chief Financial Officer at Smart Axiata, and Kevin Chuah, Director Commercial Assurance at Optus, as esteemed keynote speakers for the event. The conference is being chaired by Eric Priezkalns, Co-founder of Commsrisk formerly known as talkRA. Independent speakers include Suzanne Hodges, Director, Security Operations & Fraud Analytics at Charter Communication / Director at CFCA; Shiva Sharma, Director RAFM at Ooredoo Kuwait; Roberto Morales Soto, Project Manager at Telefonica Chile; and Aditya Ghosh, AVP IT at Idea Cellular. The theme for the Subex User Conference 2016 will revolve around Digital Transformation in the Telecom Industry. The 3 day conference will showcase customer presentations and case studies and debate on current industry topics related to digital revolution through roundtable and panel discussions. The 2016 Subex User Conference: “Connect, Communicate, Collaborate” will provide the perfect stage for our customers to understand current market dynamics and challenges and exchange thoughts on industry direction. An annual property, the User Conference provides customers with an excellent opportunity to engage and learn from collective experiences while sharing best practices and feedback. Outstanding Contribution to the Community. This award will be given to individuals who have taken a leading role in collaborating and sharing best practices with industry peers. Vinod Kumar, COO, Subex Ltd. said, “The Annual Subex User Conference provides for an excellent platform for operators, futurists, media and analysts to exchange knowledge and discuss about the ever-changing dynamics of the industry. This year the event will focus around the theme of Digital Transformation in the Telecom world. With the digital revolution which is happening in the industry today, telecom operators across the world are posed with a host of new challenges, and more importantly, an incredibly large number of opportunities as well. We look forward to discussing and debating on this new trend with key and prominent minds from across the world. The company pioneered the concept of a Revenue Operations Centre (ROC®) – a centralized approach that sustains profitable growth and financial health through coordinated operational control. Subex’s product portfolio powers the ROC and its best-in-class solutions such as revenue assurance, fraud management, asset assurance, capacity management, data integrity management, credit risk management, cost management, route optimization and partner settlement. Subex also offers a scalable Managed Services program with 30 + customers. Subex has been awarded the Global Market Share Leader in Financial Assurance 2012 by Frost & Sullivan and has been the winner of Pipeline Innovation Award 2013 in Business Intelligence & Analytics; Capacity Magazine Best Product/ Service 2013. Subex has continued to innovate with customers and have been jointly awarded the Global Telecoms Business Innovation Award 2014 along with Telstra; in 2012 with Idea Cellular for Managed Services and in 2011 with Swisscom for Fraud Management. Subex’s customers include 29 of top 50 operators* and 33 of the world’s 50 biggest# telecommunications service providers worldwide. The company has more than 300 installations across 70 countries.